Editor’s Note: The discussion regarding the addition of Hawaii to the ABA Area is ongoing, and we encourage ABA members to make their views known by filling out a proxy ballot answering this question. We hope you have also seen the August 2016 issue of Birding magazine. To continue that conversation, here’s a piece from George Armistead from May of 2012 offering some reasons why Hawaii inclusion is something that the ABA membership should consider, and a reminder of how long this particular discussion has been at the front of many North American birders’ minds. A recent poll on the ABA Facebook page posted by ABA member Morgan Churchill showed that a decided majority of those polled thought that Hawaii should be added to the ABA area. This would mean that birds seen in Hawaii could be added to birder’s North American lifelist. A heated discussion ensued. Below are my top 10 (utterly subjective) reasons why the addition of Hawaiʻi seems logical and/or desirable. 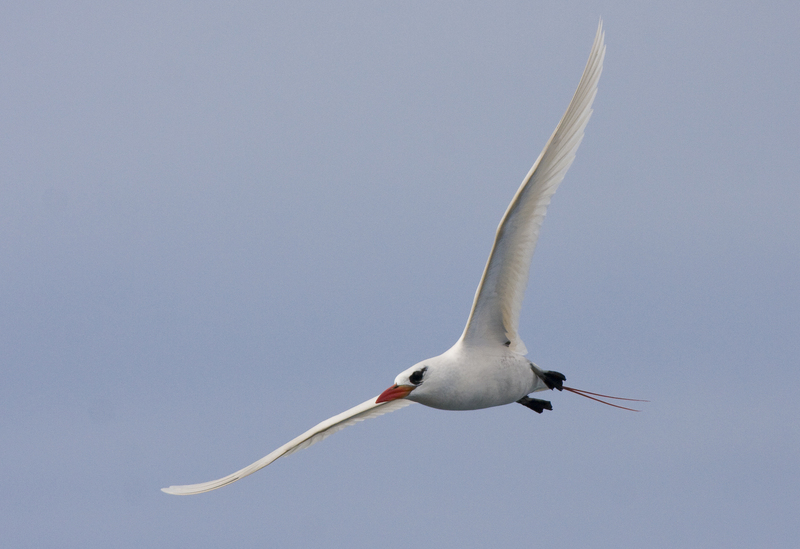 Red-tailed Tropicbird at Kilauea Point National Wildlife Refuge, Kauai (by G. Armistead). One of the most awesome birds on earth, and a trip to Hawaiʻi provides birders a good chance to see it. Pronounced “ee-ee vee”, the species produces a variety of sounds and one of the most oft-heard calls is that for which it is named; a cartoonish approximation of a car-horn, “be-BEE beep”. How the Hawaiian Goose, the “Nene”, got top billing as the state bird over the Iʻiwi is anybody’s guess. Iʻiwi in Hakalau National Wildlife Refuge, Hawaii (by G. Armistead). Those of us with non-birding spouses quickly learn how imperative it is to keep your non-birding half content, if you hope to achieve your birding objectives. Happily, Hawaii is a great place for birders and for spouses-of-birders, a.k.a. “SOBs” (what did you think I meant?). After you’ve gotten in a good day of searching for Anianiau or Omaʻo, you can meet your better half back at the beach for a little snorkeling, a happy hour cocktail, and some fine dining. Your spouse can tell you about their day relaxing on the beach, paddle-boarding, or checking out volcanoes and waterfalls. There’s plenty to do for everyone in Hawaii. It’s a win-win. The forest in Kauaʻi gets quieter all the time. 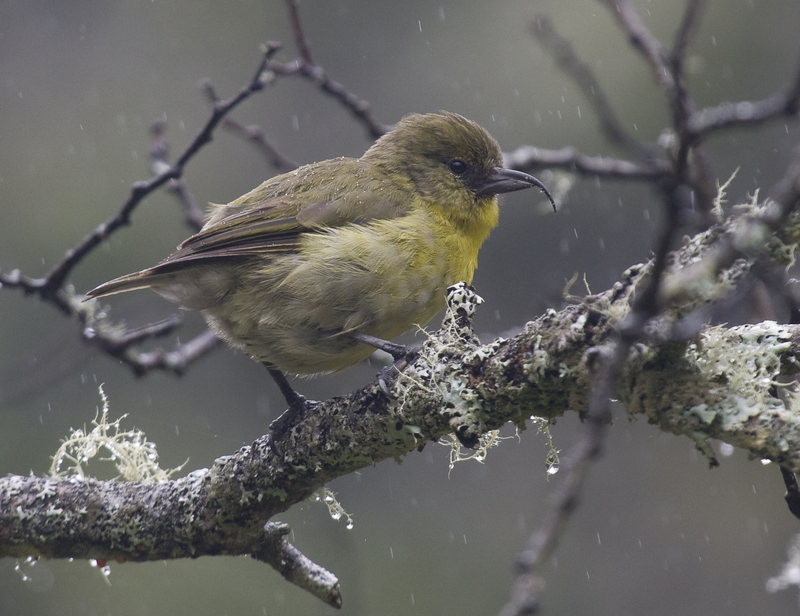 Even just five years ago birds like Akikiki and Akekeʻe were fairly easily found. Their numbers have declined to the point that finding them now is rather difficult on a short visit. Adding Hawaiʻi to the ABA area might inspire some birders to go and see these unique species before they disappear forever. 7. More Birder Attention = Improved Conservation? Over 33% of the listed endangered birds in the U.S. are Hawaiian, yet they receive only 4% of the federal funds dedicated to recovery actions (Leonard 2008). The two species that receive the most funding are the Hawaiian Crow and the Palila, yet most of the money they receive is due to lawsuits filed on their behalf, compelling the USFWS to expend resources on their recovery. If birders knew more about Hawaii’s native birds and the threats facing them, perhaps the dollars might flow a little more freely in their direction. George Wallace of the American Bird Conservancy says that adding Hawaii to the ABA area “has great value in raising awareness about the species and their plight and may attract new supporters for conservation action.” Many Hawaiian birds are still easily found, but for how long? A what!!? You know, a Humuhumunukunukuapuaʻa… or, if you prefer a Reef Triggerfish, the state fish. They are cool, and if you do a little snorkeling while in Hawaiʻi, there’s a good chance you’ll see one. The crazy Hawaiian name means “fish that grunts like a pig”. There’s not too much to it, though it does take a little practice. With just 13 letters it doesn’t take long. The Hawaiian Alphabet consists of the 5 vowels (never “y”), and 8 consonants: h, k, l, m, n, p, w, and the ʻokina. The ʻokina is that backwards-looking apostrophe-like thing, which represents a glottal stop. While the forest birds on Hawaiʻi are indeed awesome, the seabirds sort of steal the show, and many can be seen right from shore. Tapping into these for one’s ABA list would sure be satisfying. White Terns nest right in Waikiki, and a timely visit to Kilauea Point National Wildlife Refuge should net you stupendous views of two tropicbird species, Great Frigatebird, Wedge-tailed Shearwater, Laysan Albatross, and a sulid or two. There are places on Kauaʻi where one must “brake for albatrosses”; heed those “albatross crossing” signs! (I can’t think of any other spot in the world other than Taiaroa Head in New Zealand where you can find drive-up albatrosses). Pelagic trips off Hawaii yield other goodies too, such as Mottled Petrel, Christmas Shearwater, and Bulwer’s Petrels among others. 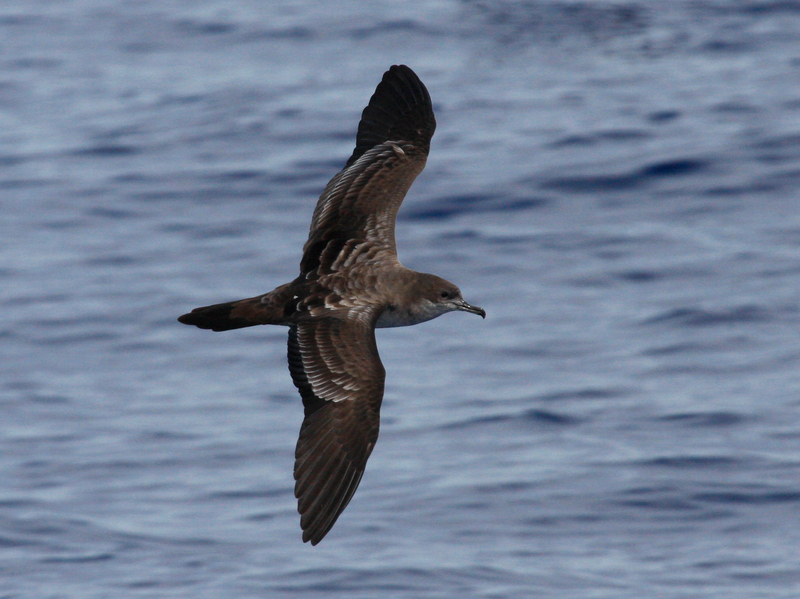 Wedge-tailed Shearwater over the Kaulakahi Channel (by G. Armistead). Few places in the world have been more befouled by releases of alien bird species than Hawaii. The impacts have been severe, but even in spite of that it is still kind of fun to see free-ranging Kalij Pheasants, Chestnut-bellied Sandgrouse, Lavender Waxbills, White-rumped Shamas, or to hear the far carrying calls of the Hwamei. These are just a few of the many introduced bird species that the ABA checklist committee would have to consider adding to the official checklist, should Hawaii be added to the ABA area. 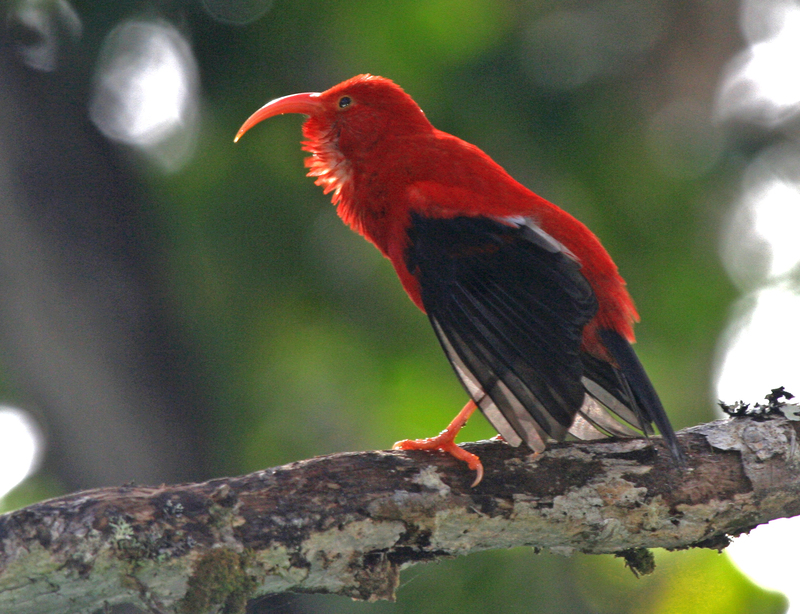 One of the state’s most sought-after birds is the strange and charming Akiapolaʻau; often just referred to as the “Aki”. This is a species we want on the ABA list… Have you seen the bill on that thing!? Also, it behaves like a woodpecker, but is sort of more nuthatch-like in GISS. It uses its straight peg-like mandible to hammer away at the branches of the Koa tree, and then uses its absurdly slender, decurved maxilla to extract insect larvae. Few bird species in the world sport a more specialized bill. Akiapola’au on Hawaii (by G. Armistead). Why should the 50th state be excluded? Sure there are reasons to consider including Greenland, Bermuda, the Bahamas, and Puerto Rico in the ABA area, but let’s start by including each of the 50 states. If I were a birder in Hawaii I’d be pretty bummed out that the big national birding organization of my country chose to omit my state from its treatment of “North America”. There are not a ton of birders in Hawaii, but we are talking about some cool folks out on these islands. We could all learn a lot from each other. Making people more cognizant of Hawaiian birds and the challenges they face could pay dividends for conservationists. The 50th state could use a little help, and I say we give it to them. Also, birding in Hawaii is fun. Hawaiian birding veterans will note that I didn’t even mention that Bristle-thighed Curlew is a lot easier to see in Hawaii than in Alaska. And, there are a bunch of endemics, a unique subfamily (Drepanidinae) of finches, some sweet seabirds, and few places offer more beautiful scenery, and have such fantastic food. We are lucky enough to have one little corner of the Polynesian Triangle in our country, so why not take full advantage? My thanks to Eric VanderWerf, Peter Pyle and George Wallace for their contributions to this article. Leonard, D.L. Jr. 2008. Recovery expenditures for birds listed under the US Endangered Species Act: The disparity between mainland and Hawaiian taxa. Biological Conservation 141:2054-2061.